The Pilgrim's journey to America began in 1608 when they were forced to leave their native England for Holland. Their Puritan religious beliefs were in conflict with those of England's Anglican Church. As the Anglican Church and the monarchy of King James I were one, the Puritan's opposition could be interpreted as treason; consequently, they felt it prudent to leave the country. By 1620, the Puritan's experience in Holland had gone sour and they returned to England with the objective of making passage to America. Problems plagued their departure from the start. Leaving Southampton on August 5 aboard two ships (the Mayflower and the Speedwell) they were forced back when the Speedwell began to leak. A second attempt was thwarted when the Speedwell again began to leak and again the hapless Pilgrims returned to port. Finally, after abandoning the Speedwell, 102 Pilgrim passengers departed from Plymouth aboard the Mayflower on September 6. The intended destination was Virginia where they planned to start a colony. After a journey of 66 days they made landfall at Cape Cod near present-day Provincetown - more than 600 miles off course. "...the ship was thoroughly shaken, and her upper works made very leaky." "...they put to sea again with a prosperous wind, which continued several days together, which was some encouragement unto them; yet according to the usual manner many were afflicted with seasickness. And I may mention here a special work of God's providence. There was a proud and very profane young man; one of the sea-men, of a lusty, able body, which made him the more haughty; he would always be condemning the poor people in their sickness, and cursing them daily with grievous execrations, and told them, that he hoped to help to cast half of them over board before they came to their journey's end, and to make merry with what they had; and if he were by any gently reproved, he would curse and swear most bitterly. But it pleased God before they came half seas over, to smite this young man with a grievous disease, of which he died in a desperate manner, and so was himself the first that was thrown overboard. Thus his curses fell on his own head; and it was an astonishment to all his fellows, for they noted it to be the just hand of God upon him. After they had enjoyed fair winds and weather, they encountered many times, crosswinds, and met with many fierce storms, with which the ship was thoroughly shaken, and her upper works made very leaky; and one of the main beams amidships was downed and cracked, which put them in some fear that the ship could not be able to perform the voyage. So some of the chiefs of the company, perceiving the mariners to fear the condition of the ship, as appeared by their mutterings, they entered into serious consultation with the master and other officers of the ship, to consider whether to return, rather than to cast themselves into desperate and inevitable peril. And truly there was great distraction and difference of opinion amongst the mariners themselves. But in examining of all opinions, the master and others affirmed they knew the ship to be strong and firm underwater; and for the buckling of the main beam, there was a great iron screw the passengers brought out of Holland, which would raise the beam into its place; which was done. The carpenter and master affirmed that with a post put under it, set firm in the lower deck, and other ways bound, he would make it sufficient. And as for the decks and upper works they would caulk them as well as they could, and though with the working of the ship they would not long hold firm, they would be safe as long as they did not over-stress her with sails. So they committed themselves to the will of God, and resolved to proceed. In many of these storms the winds were so fierce, and the seas so high, as they could not bear a knot of sail, but were forced to heave to [face into the wind to stop the ship], for many days together. And in one of them, as they thus lay hove to, in a mighty storm, a strapping young man (called John Howland) was, with a lurch of the ship thrown into the sea; but it pleased God that he caught hold of the ropes which hung overboard. He held his hold (though he was many feet under water) till he was hauled up by the same rope to the brim of the water, and then with a boathook and other means got into the ship again, and his life saved. In all this voyage there died but one of the passengers, which was William Butten, a youth, servant to Samuel Fuller, when they drew near the coast. ...after long beating at sea they fell with that land which is called Cape Cod: they were not a little joyful! After some deliberation amongst themselves and with the master of the ship, they resolved to sail southward to find someplace about Hudson's river for their habitation. But after they had sailed that course about half a day, they fell amongst dangerous shoals and roaring breakers, and resolved to bear up again for the Cape, and thought themselves happy to get out of those dangers before night overtook them. Being thus arrived in a good harbor and brought safe to land, they fell upon their knees and blessed the God of heaven, who had brought them over the vast and furious ocean, and delivered them from all the perils and miseries thereof." William Bradford's account appears in: Davis, William, T. (ed), Bradford's History of Plymouth Plantation, 1606-1646 (1908); Morrison, Samuel Eliot, Builders of the Bay Colony (1930). "Aboard the Mayflower, 1620," EyeWitness to History, www.eyewitnesstohistory.com (2004). 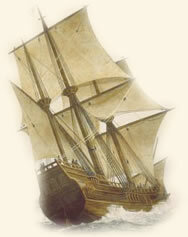 The Mayflower's journey covered a distance of approximately 2,750 miles. Descendants of John Howland - the man who fell overboard - include President Franklin D. Roosevelt, both Presidents George and George W. Bush, poet Ralph Waldo Emerson and actor Humphrey Bogart.